Most of the plants that are among the first to blossom after the long Israel summer are tubers and bulbs, known botanically as geophytes (geo = earth; phyte=plant). The underground bulbs store nutrients enabling the plants to weather the seven dry months and some to even bloom before the year’s first rains, giving them the nickname "harbingers of the rain." One of these geophytes is the beautiful winter crocus (Crocus hyemalis), which is common in the Mediterranean region, growing among rocks and in undergrowth. The winter crocus is a low-growing, stemless plant – 4-8 centimeters (1-3 inches) high, with a rosette of straight leaves marked by a length-wise white line. The winter crocus, like other members of the Iris (Iridaceae) family, has an outer "envelope" called the perianth consisting of both the sepals (calyx) and the petals (corolla). While the familiar North American crocus, frequently the first flower to blossom towards the end of winter, is a domesticated species, there are some 80 species of wild crocuses ranging from Europe to Central Asia. As most of these species are located in areas that are snow-covered much of the year, the crocus has adapted itself to blossom early – before the snows begin to fall. After the flower blossoms it remains under the blanket of snow, with the leaves budding and embryonic fruit forming in spring after the snows melt. The crocus’ early blossoming evolved as a trait even in species endemic to areas without snow, such as most of the species of crocus found in Israel. Even in the regions of Israel where snow does fall we see this characteristic: the Hermon Crocus (Crocus hermoneus), an endemic Israel species found only on Mount Hermon and on the peaks of the Samarian Mountains (near Ramallah), blooms before the onset of snow in these areas. 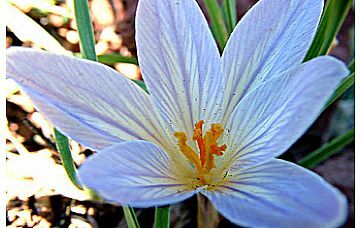 The species Crocus Cancellatus grows in the northern Golan and in the high areas of the Negev. This very fragmented distribution in Israel that we see in several of the crocus species shows that the climate change that occurred in this region during the last Ice Age, 20-80,000 years ago, led to northern mountain plants “migrating” to the southern mountains. As temperatures rose, these plants retreated northward and are found today at colder and more isolated elevations, such as Mount Hermon, the Negev highlands, and the higher hilly areas of Judea and Samaria. It is worth noting that the importance of wild flora in Israel is more than ecological, cultural or aesthetic ─ it also is the basis of scientific research; the distribution patterns of many species of plants shed light on both the historical and geological history of the region. 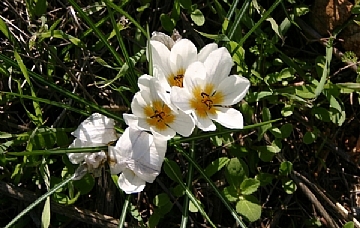 The winter crocus is unique to the Mediterranean region of Israel, Syria and Lebanon, and is the most common of the eight species of crocus in Israel. Upon close examination, the winter crocus has reveals six white perianths (the outer leaves of the flower) adorning a yellow “stain” in the center (the “yolk”) that directs the pollinating insects to the source of the nectar. The stamen has a black hue, while the pistil and leaves, split into thin offshoots, are yellowish-orange. The Hebrew name for the crocus, karkom ─ from which the scientific name derives ─ is based on the ancient Persian word for “yellow”. Another member of the crocus family, Crocus sativus, is a cultivated species with purple flowers from which the world’s most expensive spice, saffron, is extracted. The Hebrew word karkom appears one time only in the Bible, listed among several spices “Spikenard and saffron [crocus], calamus and cinnamon, with all trees of frankincense; myrrh and aloes, with all the choice perfumes” (Song of Songs 4:14). 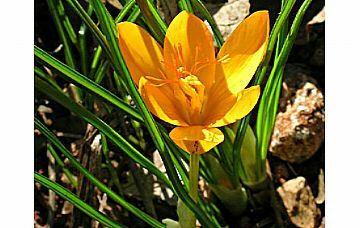 Other sources refer to the crocus as representing something of exceptional value (“And she was loved by him, like a field filled with crocuses” – Jerusalem Talmud, Sanhedrin 12b), or symbolizing the color yellow, as in the Mishna Nidda 4:6. When referring to a person’s face, yellow became a mark of embarrassment, disappointment or hurt, as expressed in a Midrash telling of Moses’ embarrassment upon asking the Lord about the purity of the cohenim (priests) that went unanswered, “At the moment, Moses’ face ‘yellowed’ (Hebrew – Nit-karkom-u)” (Midrash Rabbah, Parashat Hukkot). The white crocuses appearing against a background of dark, rain-saturated soil at a time of year when daylight hours are few and dark clouds dominate the sky resemble glistening “candles.” This image is reminiscent of Hanukkah, the Festival of Lights that closes out the Hebrew month of Kislev. At Neot Kedumim, winter crocuses are abundant in areas of leafy undergrowth.